Late in 2017, the Kansas City Chiefs traded away veteran quarterback Alex Smith, handing the offense over to their young stud…and the rest is history. You don’t need me to tell you that Patrick Mahomes lit the NFL on fire in 2018 so let’s just touch on a few things. Mahomes became the third player to ever throw 50 touchdowns in a season (P. Manning, Brady) and was the sixth player to ever throw 5,000+ yards (P. Manning, Brady, Stafford, Marino, Brees). Mahomes is the second player to ever do both in a single season (you guessed it..Manning was the other one). Patrick Mahomes has clearly arrived in the NFL and, just for the record, he’s the real deal…but he won’t be on any of my fantasy football teams. Why in the world would you not want Mahomes? During his sophomore season, Mahomes racked up 519 PPR points. That was enough to put him firmly at the top as the number one among all players. There are a couple of issues here though. Mahomes explosive entry into the league drove his fantasy value through the roof. In many leagues, he’s being drafted as early as round 2, and in some dynasty leagues, he is being drafted in the first round! 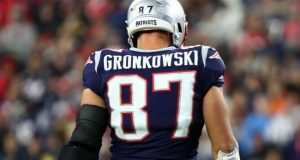 Aside from the draft price, his unimaginable season seems unlikely to repeat itself in 2019. Seriously though, Mahomes is great and any argument against that is ridiculous ..but how great is he really? Peyton Manning (most touchdowns in history) averaged 31 touchdowns/year over his career (excluding the year missed due to a neck injury). Mahomes’ whopping 50 touchdowns led the league by far but can you expect the average to go from 31 to 50? No, you can’t. The driving factor there was Mahomes’ 2018 touchdown percentage (TD%). At a league-high 8.62%, Mahomes had the highest TD% since 2011 (Rogers 9.0% with 45TD). It’s important to note that Rogers has only ever led this category twice in his career and that he has never exceeded his level of efficiency in 2011. The point? It’s not reasonable to expect Mahomes to average 8.62% of his passes caught to be touchdowns year after year. It’s just not. Another mind-bending number is the number of yards thrown by Mahomes (5,097). Drew Brees is one of the five other players to have thrown over 5,000 and he has done it, coincidentally, five separate times. That’s good news for Mahomes. Admittedly, the league is changing to a more pass-heavy game, and knowing that Brees has been able to throw for over 5,000 yards multiple times tells us that Mahomes should be able to do that as well. Knowing all of that, it’s hard to imagine that Mahomes will average 50 touchdowns and 5,000 yards every year, is it safe to assume that Mahomes scored more touchdowns or threw more yards this year than his average will be? If not induct him into the HOF now! 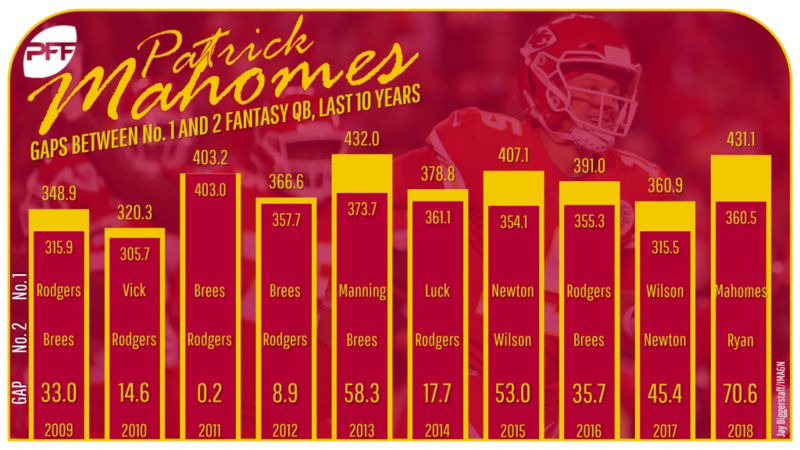 Expect regression from Patrick Mahomes in 2019, this is crucial. Next comes the issue of draft price. At 500+ points, Mahomes earned an average of 7.9 points per game MORE than the next six highest scoring QB’s averaged. 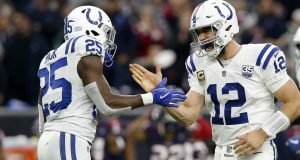 The six we’re comparing are Luck(8th round), Brees(6th round), Ryan(9th round), Roethlisberger(10th round), Goff(11th round), Wilson(6th round). The number in parenthesis is where those players were drafted in PPR leagues in 2018. A seven-point per game advantage sounds fantastic but remember how 8.62% of all of his completions were touchdowns? 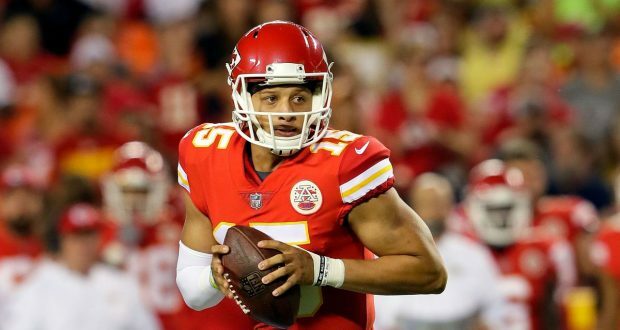 If we projected Mahomes no regression other than TD% for 2019 he would throw over 5,000 yards on 580 attempts with a completion ratio of 66% but reduce his insane number of touchdowns to 37 (6.38TD%) (Rogers career average is 6.2%). With this projection, the advantage over the next six at the position would be a humble three points per game. Oh, and remember how Mahomes was drafted late? In 2018 Mahomes was the fifteenth QB off the board and could be had in the 10th round. 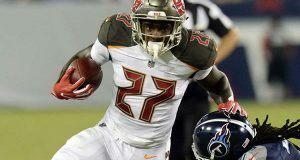 Teams that selected him in the 10th round could realistically also have drafted Todd Gurley (369pts) + Keenan Allen(261pts)(or M Thomas/D Adams/C McCaffrey) + Tyreek Hil(328pts) …adding in Mahomes 519 PPR points that team would score 1,477 points among those four players. That’s 92 points per game with four roster spots yet to fill. This is the reason that in 2018 Mahomes was high on the list of players on championship rosters. And because of all of that, he is already being drafted in the 2nd round. If selected in the second round, using the example just above, you would certainly be sacrificing a WR1/RB1 for a QB that might give you a 3 point advantage. That’s a lot of info to digest. But here is the jist: Mahomes is undeniably a top ten quarterback. And If Mahomes has back to back elite seasons he could still realistically only offer you a three-point per game advantage at the position, and it could cost you a top ten WR or RB to get those three points. That’s why drafting Patrick Mahomes could cost you your 2019 fantasy football championship.